The detection of harmful chemicals and microbial pathogens in food and water destined for consumers is of paramount importance the world over and it is vital that new techniques and discoveries are widely disseminated. 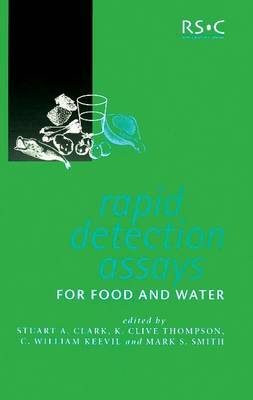 Bringing together international experts in the field, Rapid Detection Assays for Food and Water presents original, state-of-the-art research and a review of the established methods in this key subject area. Covering the four main areas of water microbiology, water chemistry, food microbiology and food chemistry, the book discusses highly sensitive chemical and biological detection systems. There are applications ranging from sample preparation methods to end detection. Subject areas include biosensors, the detection of pesticide residues, GM components, various chemicals and toxins as well as protozoan parasites and viral/bacterial pathogens in a wide range of materials. This book will be welcomed by researchers and professionals in industry, academia and government agencies.